Dear Kimmy- I’ve been told that it’s possible to apply binding to the quilt while it’s still mounted on my quilting machine. Is such a thing possible and, if so, how do I do it? Kimmy says- It’s not only possible to apply binding on your stand-up quilting machine, it’s fast, easy, efficient, and I do it all the time! 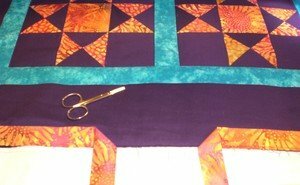 Before I proceed with the instructions, however, let me issue a small disclaimer; this is not a technique that you will want to use on a quilt that needs to hang perfectly flat and square, such as a wall hanging or show quilt. For best results, those quilts should be bound using traditional methods of binding application. When it comes to ‘every day’ quilts, though, this technique is the slickest thing since peanut butter in a jar and once you’ve tried it you’ll be hooked. Quilt as you normally would, but do not remove the quilt from the machine when you’ve finished quilting. 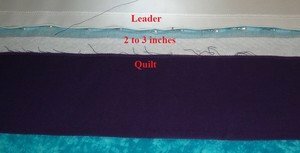 At this point, your quilt should be pinned to two leaders only; the take-up leader at the top and the backing leader at the bottom. Because your quilt top has now been removed from its leader and attached to the backing fabric by the quilting stitches, you are now free to roll and unroll the quilt at will. Unroll the quilt all the way back to the top, so that the top border of the quilt is in the center of your work area and within easy reach. Prepare your binding as you normally would, in the width that you prefer. The binding should be approximately 12 inches longer than the perimeter of the quilt. My favorite trick when prepping the binding is to use a bit of spray starch when pressing. By applying a small amount of starch to the wrong side of the fabric before pressing it in half I find that, in addition to adding a wonderful crispness to my finished binding, the starch acts like glue and holds the two sides of my binding firmly together and prevents the sides from shifting or separating during the application process. 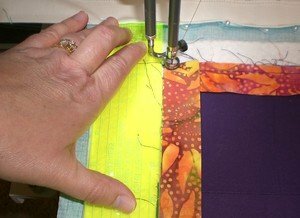 Rather than trying to slide your ruler along as you stitch, it is much wiser to stitch for 6-8 inches, stop with your needle down, shift the ruler to its new spot, smooth the binding back into place if it has shifted (being careful to avoid stretching the binding as you do so) and then resume stitching. Just as when you apply your binding using traditional methods, it is critical that your binding not be stretched tighter than the quilt to which it is being applied. A too-tight binding will draw up the quilt edge and cause it to distort. A too-loose binding will be drawn up and distorted by the quilt’s edge. Make sure your binding and quilt top are evenly tensioned at all times. 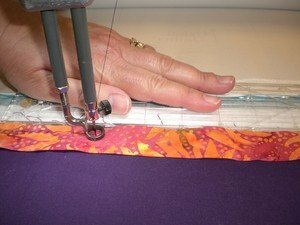 After making several locking stitches, stitch down the side of the quilt, stopping every 6-8 inches to realign the ruler and smooth the binding into place, until you run out of work space. Lock your stitches and break your thread. Move back to the upper right hand corner of the quilt. Once again you will fold the binding away from the quilt at a 90 degree angle, and then fold it back on itself to form a mitered corner, just like you did on the upper left hand corner. Align the raw edges, smooth the binding into place, line up your ruler and stitch the binding into place with a ¼ inch seam allowance, stopping every 6-8 inches to make necessary adjustments. Stitch until you run out of work space but this time, instead of locking your stitches and breaking your thread, stop with your needle down, *very carefully* advance the quilt with the needle still in place until the needle is approximately 5-6 inches from the take-up roller and a new section of quilt has been exposed. Smooth the binding into place along the newly exposed right hand side of the quilt, aligning the edges and lining up your ruler, and resume stitching. Stitch until you have run out of work space, lock your stitches and break your thread. Move back to the left side of the quilt, smooth the binding into place along the newly exposed area of the quilt, and align your needle with the previously stitched line so that you can resume stitching exactly where you left off. 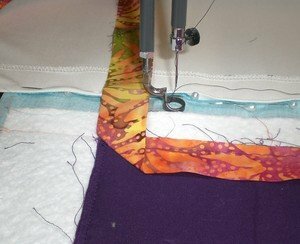 When you come to the end of the work space, stop with your needle down, *very carefully* advance the quilt until the needle is approximately 5-6 inches from the take-up roller, smooth out the binding, and resume stitching. In this manner you will leapfrog from the left side to the right side and back to the left side, alternately ending your stitching line/breaking your thread and stopping with your needle down/advancing the quilt. 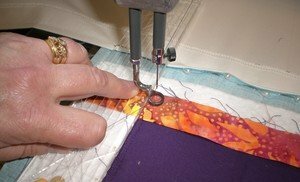 Remove the quilt from the machine and finish the binding on your domestic sewing machine, attaching the binding ends using your favorite method. Trim away the excess backing and batting. The binding is now ready to be turned to the back side and stitched down either by hand or machine, according to your preference. This fast and efficient method is sure to become a favorite in your studio and, if you quilt for customers, can be an excellent source of additional income. Give it a try and see what you think!